Before leaving she saw a piece of ceramic tile that one of our grandsons had painted as a marker for our dog Chico’s ashes. We used to keep in a flower bed in our back yard where we had scattered his ashes. She didn’t know what it was, but she thought it was pretty and asked me if she could take it with her in the car. Of course, I said she could. We had enough time to stop by Panera for a muffin before an 11:20 appointment with her ophthalmologist . She asked if it would be all right to take it in the restaurant. I told her that would be fine. We put it on our table. At Panera we had one of those nice conversations that occur periodically. She was in a very good humor and talkative. We talked about our lives and how fortunate we have been. She again showed how perceptive she can be when she said, “If you are with someone you like, it doesn’t matter where you are.” I agreed. After all, this was one of those moments that are special. We were just at Panera having a blueberry muffin, but it is the kind of moment I will treasure in the days ahead. How grateful I am that this is possible so late in her journey. I talk a lot about deriving much of our pleasure from Kate’s intuitive abilities. That frequently involves music and our social activities. There are lots of other signs of her intuitive abilities that I don’t say much about. Let me tell you about a few experiences that occurred yesterday. She got up to go to the bathroom shortly before 6:00. She was especially groggy. I walked with her to show the way. I asked if she wanted fresh underwear. She said she did. Then she walked over to the sink to wash her hands. She turned to me, smiled and said something I can’t quite remember. I know what it meant though. It was “We didn’t envision this when we married.” She not only retained her sense of humor, but she was able to grasp the situation in a way that I might not have thought she could. As I walked her back to bed, she smiled and said, “Are you havin’ fun yet?” She thanked me as I pulled the covers over her. Several hours later as I was putting drops in her left eye (her cataract surgery is tomorrow. ), she had trouble understanding that I wanted her to tilt her head back to make it easier. She got a little irritated with me. I told her I was sorry, that I was just trying to help her. She said apologetically, “I know you were.” She was sorry for the way she spoke to me. This took an understanding and appreciation of what I was trying to do, and she felt she had hurt me and was sorry. She was up at 9:30. That gave us time for a trip to Panera for her muffin before lunch. We hadn’t been seated long before she asked my name and hers several times pretty close together. We got into a conversation about our parents, mine as well as hers. That led her to say how fortunate each of us has been, not just in the parents we had but in so many other ways. She began to talk about people who haven’t been as lucky. As she talked, she got tears in her eyes and choked up. She couldn’t continue her thought. She was overcome by emotion. She has never been one to shed tears easily. Alzheimer’s has changed that. She was finishing up her muffin when I said we would be going to lunch in a while. She said she was full and might not want to eat much. Then she said, “Knowing me, I might change my mind as soon as we are there.” I was struck by that because it is so apt. She frequently says she won’t be able to eat or eat much before going out but changes her mind once we are there. She has remarkable insight about her own personality as well as mine even when she can’t remember either of our names. She was very talkative at Panera, and, at lunch, we had another great conversation. She (we) talked almost the entire time we were there (almost two hours). Only half of that conversation was about Frank Sinatra. <G> Just kidding, but I didn’t even try to count the number of times she asked his name. One time after I told her, she said, “I don’t know why I can’t remember his name. I ask you all the time.” I said, “But you don’t forget that you don’t like him.” She agreed. Like other conversations, this one focused heavily on feelings, things that don’t require a memory of facts. Her parents and mine figured in the conversation. We expressed our feelings about them. We are both grateful for our parents and the way we were raised. One time when our server stopped by to check on us, I mentioned how much we had enjoyed the Chicken Marsala. In a few minutes, she returned with the chef (a woman) who had prepared it for us. We thanked her. She said to let her know whenever we are there and that she would take care of us. Kate and I were both touched that our server thought to introduce us. On the way home, Kate kept saying how much she enjoyed the CD I was playing. It is one I bought several years ago in Memphis for $5.00 when we were visiting Jesse and her family. It’s a compilation of songs from a variety of Broadway shows. She likes it so much that it is almost the only one I have played for the past few weeks. I am amazed that she remembers so many of the words, especially the key phrases. I know from things I have read about music and people with dementia, Parkinson’s, or strokes that music can facilitate the words as well as the music; however, hearing her sing the words always surprises me. An interesting sidelight is that this CD does not provide the names of the singers. Every time a song plays, Kate asks me to tell her who is singing. Each time I tell her I don’t know, and the CD doesn’t give any of the singers’ names. That is something she never remembers, so she asks her question a lot going to and from place to place. When we got home, I built a fire and we spent the afternoon relaxing. Kate lay on the sofa and frequently talked about the things she could see and liked both inside and outside. As usual, she mentioned the trees that she could see through the skylights. It’s interesting that she responds to the trees in the same way she did before they shed their leaves for the winter. She often says, “I love all the green.” She also talked about the music, the fire, and a painting we had purchased on trip to Quebec City years ago. The entire day she was especially appreciative, not just for my care for her but for all of her experiences. Her intuitive abilities were not only alive and well but very active. I’ve written two posts in the last few days that deal with Kate’s intuitive abilities. This is another one. Last night she had an emotional experience that illustrates how powerful those abilities can be. This was far from the first such experience, but it was especially intense and lasted over a twenty to thirty-minute period of time. It occurred after we returned home from dinner. About two weeks ago, she and one of her sitters had watched the first half of Les Miserables. It had been a while since the two of us had watched it, so I turned on the second half. As on other occasions, she quickly became engrossed. Periodically, I noticed that she was whimpering a bit as she watched. She was also making audible expressions of her pleasure. Close to the last third of the performance, I brought her meds to her. Then I started to refill the pill holder in the bathroom. I was just about finished when she called my name. It was obvious that she was moved by what she was watching. When I responded, she asked if I could come to her. I went over to her and got down on one knee beside her chair. I asked what I could do for her. She said she just wanted me to be with her. Then she took my hand. I said, “It’s beautiful. Isn’t it?” She said, “Beautiful and sad.” She talked off and on for the remaining portion of the performance. She thought it was so sad that we have wars. She explained that she believed there are times when war becomes necessary but it is so horrible that so many people have to suffer. She has always been moved by WWII and specifically the Holocaust. She said she couldn’t understand why so many Jews had been killed during the war. She repeated her thoughts for at least the next twenty minutes. As I mentioned in one of my earlier posts, I felt this was a time for comfort as opposed to words. I listened and held her hand and supported her feelings. That continued until the end of the musical. We went to bed shortly afterward. This experience makes me think about many of the movies we have enjoyed over the past several years. I don’t believe she has been able to follow a plot or understand much of what is going on for at least four or five years; however, that hasn’t prevented her from enjoying movies. For a long time, I wondered how that can be. Then I began to understand that the characters and situations must have communicated some emotional message that she liked. That was illustrated most vividly in several of the movies she has enjoyed during the past year. One was Darkest Hour. In that case, she did understand that it dealt with Churchill and WWII. She was able to connect with the seriousness of the events portrayed as well as the drama conveyed by the acting, visuals, and sound. The other two were documentaries, RBG and Won’t You Be My Neighbor? Even without following the story, she was able to get a feeling for both Justice Ginsberg and Mr. Rogers. She easily understood that the films conveyed positive impressions of each one and liked them. 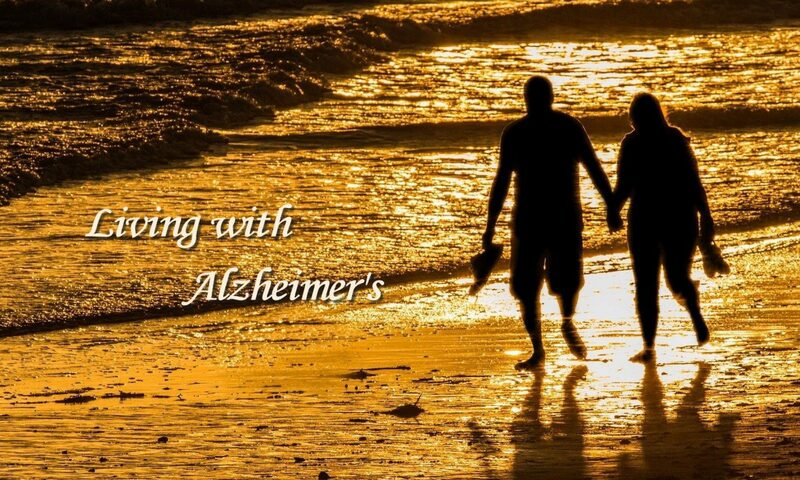 One of the things I have learned since Kate’s diagnosis is that most people think of the last stages when they hear of someone with Alzheimer’s. They don’t imagine that stage is just the tip of the iceberg. We’ll be there sooner than I would like. In the meantime, I will continue to celebrate the fact that there are so many things that she can enjoy. Her intuitive abilities are still working even as her rational ones disappear. Yesterday I decided to let Kate sleep a little later than the past few days. I checked on her at 11:00 and found that her eyes were open. I asked if she would like to get up. She asked me to give her a little more time. I went back in twenty minutes. She was awake. I told her it was getting close to the time we should leave for lunch and thought she should get up if she could. She indicated she was hungry. I said something about her having slept later than she had during the time Virginia and Ken were visiting. She said, “Who?” I told her again. She didn’t recognize who I was talking about. I said, “Ken is your brother.” There was no sign of recognition. She said, “What’s his name?” I repeated his name. She usually says she likes the name “Franklin.” This time it meant nothing to her. She did ask where he got his name. I told her from his mother and father and that they were also her parents. She wanted know their names. I told her. She wanted me to repeat their full names. She asked me to do it again. She wanted me to say each name (first, middle, and last) slowly so that she could repeat each one. When I had done this, she wanted to know my name. I told her and told her I am her husband. She was surprised. I told her a little bit about our courtship and then our marriage in her home church. She was still puzzled but accepted what I had said. Two things struck me about this experience. The first is that it’s one more time that it took her a while to acknowledge that we are married. It’s getting harder for her to remember that. The second is that she continues to trust me as someone she knows. She shows no sign of fear. She seems perfectly comfortable with me. I am grateful for that. All of this must have taken fifteen minutes. She finally got up a little after noon. She took a shower and then got back in the bed. I got her up just after 1:00. It was 1:45 when we left for lunch. Just before leaving, she walked out of the bathroom with a tube of toothpaste and a toothbrush in her hand and asked, “Are we going to stay another night?” I told her we were. Then I took them back to the bathroom. The rest of the day went quite well. I saw no indication that she forgot that I am her husband although she did ask my name a number of times. At lunch she said something affectionate and immediately asked my name. Then she laughed in recognition of how strange it sounded to pair those two things. Twice she mentioned that she remembered coming to the restaurant with her mother although her mother had never been there. There is one other thing I haven’t commented on before. The restaurant where we eat each Sunday has several prominent photos of Frank Sinatra, and much of their music features him. One of the photos was taken when he was arrested for seduction and adultery in 1938. Kate asked me about the photo the first time she saw it. I explained and also said something about his mob connections. I didn’t think much of it, but every Sunday she asks me who he is multiple times. When I say his name, she always responds negatively. Today, for example, she said, “He’s a rat.” Then she said, “I don’t know why I feel that way.” It’s another good example of how well she can hold on to feelings while she so easily forgets names and other facts associated with them. I was about to finish this post when I recalled one other example of the power of feelings. Last night I played several YouTube videos of Christmas music when I suggested it was time to get ready for bed. She got up from her chair to walk to the bathroom. As she did, she commented on the beautiful music and how special it was that we could share it together. Then she asked my name. A few minutes later she called me by name. She hasn’t completely forgotten it yet. When she came out of the bathroom, she said, “I’m glad we came here.” A few minutes later she asked where we are and how I found “this place.” I told her I couldn’t remember. She thanked me for bringing her here. All of these things are signs that she is still able to feel, enjoy, and appreciate things. I am grateful. We have made the most of that ability in the past and will continue to do so even as the names and recognition of people and places recedes from her memory. This is Thanksgiving week, and we leave tomorrow to spend the holiday with our son Kevin and his family. As you would expect, Kate and I are approaching this trip in very different ways. This is very likely her last trip to her home state of Texas. I have been thinking about this trip for months. Her feelings for Texas are actually stronger now than they were when she was younger, but one of the things that disappeared with her memory is the ability to anticipate the future. I have been telling her for weeks that we are going to be in Lubbock for Thanksgiving. I’ve heard that the estimated length of time that a person at this stage of dementia can remember is a matter of seconds. As a result, she has no idea that we are going. She will enjoy the visit with family and being in Texas “in the moment” as she does with all her experiences. There is usually a bit of sadness associated with “last-time” experiences. I think immediately of the time when a child leaves for college or gets married. Parents know that their lives will be changed forever. The sadness brought on by those experiences is partially offset by the pleasure we derive from watching our children take their place in the world as adults. That is very different from the anticipated loss of someone who is approaching the end of life. I derive much pleasure from my recall of our lives together. I believe we have made the most of our time, not only since Kate’s diagnosis but from the beginning of our courtship. We will continue to enjoy life together as long as we are able. I have to say, however, I cannot escape the sadness of these last experiences. I believe that is as it should be. The tenderest moment came as we were finishing our meal. By this time I had reached across the table and taken her hand. She looked at me and said something complimentary. Then she started to say something else and stopped. She said, “No, that’s silly.” I pushed her to tell me. At first, she wasn’t going to say. Then she said, “Would you think of marrying me?” Before I could respond, she said again, “Oh, I know that seems silly.” Then I looked into her eyes and said, “I have a surprise for you.” She said, “What?” I said, “We are married, and I love you.” She was immediately touched and tears filled her eyes. Then I was touched, and here we were sitting in a neighborhood Mexican restaurant, a far cry from a romantic place. Earlier today I read a tweet by Ann Campanella, author of Motherhood: Lost and Found. She said, “Blessings and loss are so often intertwined in our lives.” I replied that Kate and I frequently have such experiences. Little did I know that we would have one of those tonight. The loss of her not remembering that we are married was overshadowed by her ability to appreciate my caring for her, by her proposal of marriage, and her tender response when I told her we are already married.